Image from Tabica Grill’s Facebook Page. 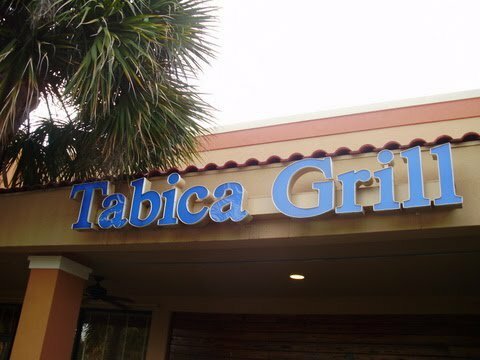 If ever you’re in Jupiter, Florida with your family, I highly recommend you stop by Tabica Grill. We found the place one afternoon we were starving from a local dog beach. We were thrilled to be able to go to a place that not only had really good online reviews, but allowed us to sit outside with our pup. And to top it all off, they brought out a water bowl for him to cool off. Although the outside seating isn’t the most inviting, we loved the staff. Everyone seemed dog-friendly and were quick with our orders, even the refills. On our first trip, we ordered Asian wings as an appetizer. One word: delicious! The wings seem to be fried in the sauce. When you bite into a very crunchy skin, you reach down into juicy white meat. And the best part is, you don’t get the sauce all over your hands like most hot wings or BBQ wings. They’re just perfect. I had their Cuban sandwich and they reminded me of the ones I would get with my aunt years ago in downtown Jersey City, New Jersey. It was the best Cuban I had in years! I ordered fresh fruit on the side for my little guy. Jeff ordered a simple burger and he loved how juicy it was. It came with fries, which he shared with Sebastian. The second time we went to Tabica Grill was on my 26th birthday and we wanted Rocky to feel special, so this time we ordered him grilled chicken without seasoning. We chopped it up and Jeff hand-fed him like the spoiled pup he is. We placed the same order as the first, Asian wings, a Cuban sandwich with fruit, and Jeff ordered a simple burger and friends. Everything was great except the Cuban sandwich had chicken in it. Although the sandwich tasted great, it was a bit odd to find chicken in a Cuban sandwich. I didn’t complain since it was fine. We had a great time, and that’s all that really mattered. Oh, and their lemonade is amazing! I got three to four refills because a certain little someone kept drinking it. Heading over to Tabica Grill? Plan ahead with their online menu.